FortiClient Enterprise Management Server License for 100 clients FortiClient Enterprise Management Server License subscription for 100 clients. Includes 24x7 support. 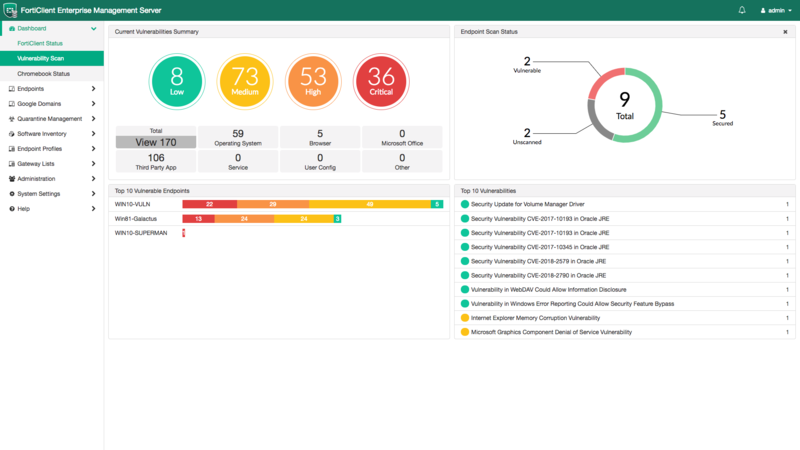 Endpoint Telemetry & Compliance License subscription for 100 clients. Includes 24x7 support. Note 1: Compatible with FortiOS 5.6 and 6.0 only; FortiOS 6.2 does not require this license. Note 2: Refer to the FortiGate documentation for platform restriction and maximum license limit. Micro-FortiGuard Server Software with support, 1 Year. The Micro FortiGuard Server provides local threat updates from FortiGuard to up to 1000 FortiClient endpoint agents. Micro-FortiGuard Server Software with support, 3 Year. The Micro FortiGuard Server provides local threat updates from FortiGuard to up to 1000 FortiClient endpoint agents. Micro-FortiGuard Server Software with support, 5 Year. The Micro FortiGuard Server provides local threat updates from FortiGuard to up to 1000 FortiClient endpoint agents. 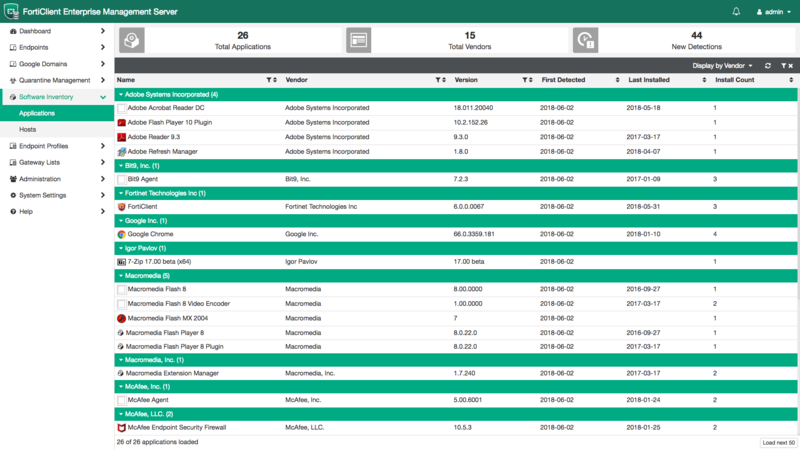 FortiClient's Security Fabric Integration, ensures that all fabric components - FortiGate, FortiAnalyzer, EMS, Managed AP, Managed Switches, Sandbox - have a unified view of endpoints in order to provide tracking & awareness, compliance enforcement and reporting. 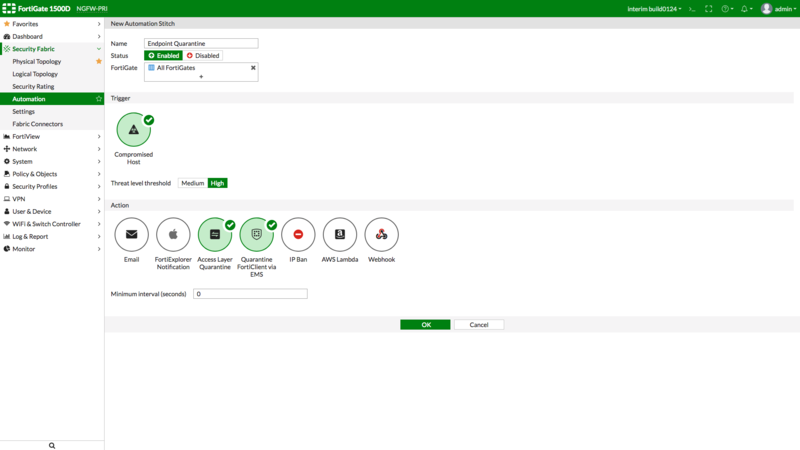 Advanced Threat Protection automates prevention of known and unknown threats through built-in host-based security stack and integration with FortiSandbox. Easy to use Secure Remote Access & Mobility via SSL and IPsec VPN. FortiClient connects every endpoint to form a cohesive security fabric. Endpoints are frequently the target of initial compromise or attacks. One recent study found that 30% of breaches involved malware being installed on endpoints. FortiClient strengthens endpoint security through integrated visibility, control, and proactive defense. With the ability to discover, monitor, and assess endpoint risks, you can ensure endpoint compliance, mitigate risks, and reduce exposure. FortiClient proactively defends against advanced attacks. Its tight integration with the Security Fabric enables policy-based automation to contain threats and control outbreaks. FortiClient is compatible with Fabric-Ready partners to further strengthen enterprises' security posture. Broad endpoint visibility FortiClient Fabric Agent integrates endpoints into the Security Fabric and provides endpoint telemetry, including user identity, protection status, risk scores, unpatched vulnerabilities, security events, and more. Endpoint compliance and vulnerability management Reduce the endpoint attack surface and manage endpoint-borne risk. Proactive endpoint defense Anti-exploit, sandbox integration, and behavior and pattern-based malware detection proactively detect and block malware, malicious scripts, document-based, and other advanced attacks. 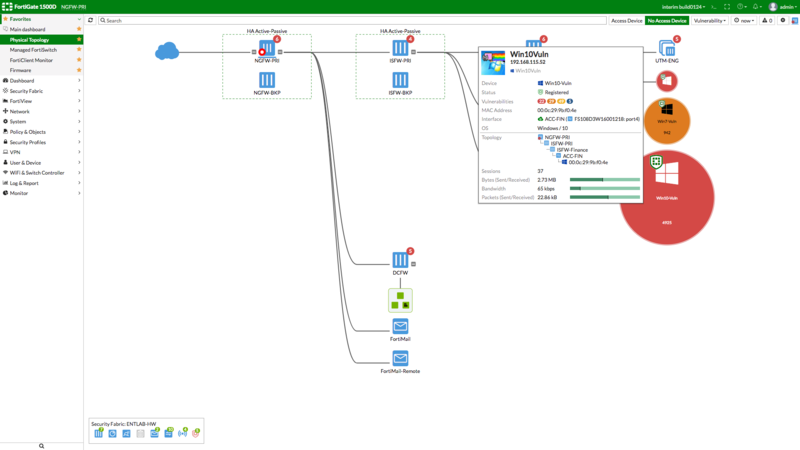 Automated threat containment Integration with the Security Fabric enables automated response. Mitigate unpatched vulnerabilities, alert users, and quarantine risky or compromised endpoints to stem an outbreak. Secure remote access Reliable, simple, and secure remote access with built-in, always-on VPN, with the added security of two-factor authentication, plus single-sign-on capabilities. Easy to deploy and manage Easy to deploy and manage Modular and light-weight endpoint agents are centrally managed with the Enterprise Manager Server (EMS). Schools continues to enhance their technologies in the curriculum and the adoption of personal devices such as Chromebook are increasingly commonplace. Schools are required to be in compliance with Children's Internet Protection Act (CIPA) and protect students from harmful content while browsing the Internet. Also supports the "cart system" where devices are not specifically assigned to one user. Mac OS X v10.13, v10.12, v10.11. 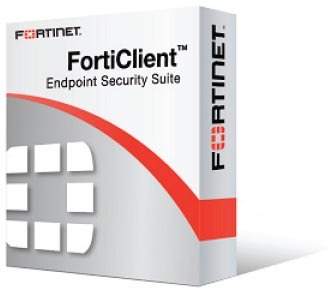 Download the Fortinet FortiClient Datasheet (PDF). FortiClient Chromebook Enterprise Management Server License for 100 users Chromebook Enterprise Management Server License subscription for 100 ChromeOS users. Includes 24x7 support. Micro-FortiGuard Server Software with support. The Micro FortiGuard Server provides local threat updates from FortiGuard to up to 1000 FortiClient endpoint agents.